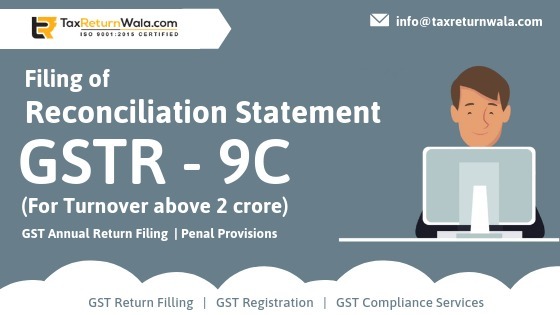 GSTR 9C is a supportive return filed with GSTR 9 for the reconciliation of information submitted by the taxpayer in its annual return with the figures of GST stated in his Audited financial statements. GSTR-9C has to be filed by every taxpayer on whom the rules of Audit referred by the GST Act become applicable i.e. businesses having an annual turnover above Rs 2 crores. Any taxpayer guided under audit rules of GST has to get his GSTR -9C prepared from a Chartered Accountant or a Cost Accountant and get the cause of difference if found any, reported to the GST department. Filling of GSTR-9C by a Chartered Accountant or a Cost Accountant works as a relying measure to the GST department on the accuracy of figures reported by the taxpayer in its annual return. The said return is to be filed by the professional through a GST facilitation center submitting all necessary documents including the Audited Copy of the Annual Return GSTR -9. Certification of Annual Return (Part B). Part 1: Basic Details 1 to 4 This includes basic details of the taxpayer, including the FY of the annual return, Trade name, GSTIN etc. 8A to 8C This includes reconciliation of gross turnover & Taxable turnover and the reasons for difference found if any. Including mention of any additional amount payable. Including tax payable on un-reconciled ITC. Part 5: Auditor’s recommendation on additional liability due to non-reconciliation. This includes the computation of the additional CGST, SGST, IGST, and Cess if any payable as per the recommendations of the auditor. The GSTR 9C is to be certified either by the Chartered Accountant who conducted the Audit of the annual return GSTR-9 or by any other CA who didn’t conduct the audit and is relying on the audit report of the other CA/auditor appointed. This assures the authorities of the facts disclosed in the annual return by the taxpayer, which has been duly verified by the appointed auditor or CA. Also, it breaks out the cause of difference found between figures (if any) in the return to be rectified by the taxpayer complying with provisions of the GST law. Filling of GSTR 9C is mandatory for all taxpayers having a taxable turnover above Rs 2 crores and for those adhering to the Audit provisions of the GST Law. For non-filling or delayed filing of GSTR-9C a penal charge of Rs 200/- per day being Rs 100/- for CGST and Rs 100/- for SGST shall be levied. Note: The due date for filling GSTR 9C along with GSTR-9 is 30th June 2019.